More than 15.5 million people visited the District last year, providing an important boost to the local economy. The number is a five-percent increase over the 2009 tourism numbers, according to a report in the Washington Business Journal. 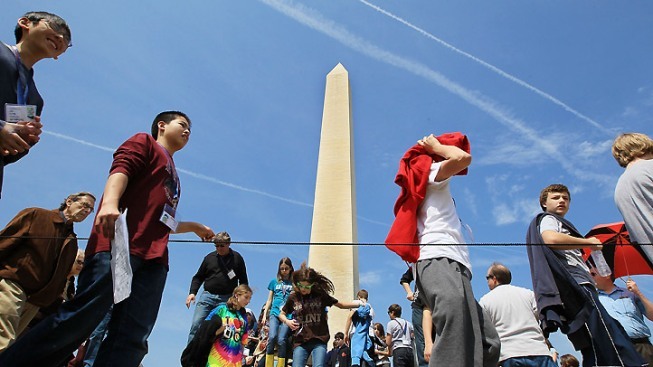 While the crowds on the National Mall and the long lines at Metro stations can sometimes irk long-time Washingtonians, there's no denying the importance of tourism for city coffers. More than half of the sales tax generated by the city comes out of the wallets of tourists. Data released by the D.C. government Tuesday shows that visitor spending increased more than 8 percent last year to $5.7 billion. That will mean about $623 million in additional tax dollars for D.C., notes the WBJ article. "I had that $5.7 billion statistic in mind every time I went to the [U.S. House] Rules Committee or the House floor to prevent a shutdown of the government," said D.C. Delegate Eleanor Holmes Norton at a press conference. In terms of jobs, statistics from last year show the travel and tourism industry supports more than 70,000 jobs, second only to the federal government. Listen to the complete story at wamu.org.